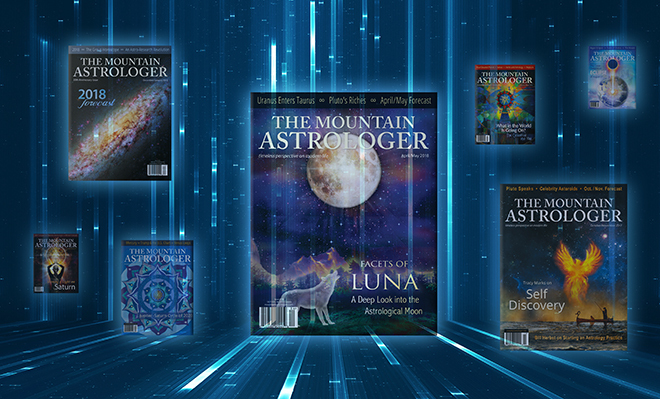 In episode 149 of the podcast Tem Tarriktar joins me to talk about The Mountain Astrologer magazine, which is one of the leading astrological publications in the world today. Tem started TMA in 1987, and during the course of the show we talk about the humble origins of the magazine, as well as some of the highlights over the years as they approach the publication of issue number 200 later this year. The Mountain Astrologer magazine, often abbreviated as TMA. TMA is one of the leading print publications in the astrological community. It has become a hub for communication and finding out what is going on. It is such a mainstay in the community that I wanted to do a show talking about it. Tem is the founder and publisher of TMA. Just celebrated its 30th anniversary issue in December / January 2018. Coming up on issue 200 in a few months. Let’s talk about the history of the magazine and how it got started. First things first, who are you, and where are you from? Tem Tarriktar natal chart: born August 7 1956 at 6:40 AM in Cleveland, Ohio. How did you get into astrology and when? Spent most of his 20s studying metaphysics. Started TMA in late 1987. 2 years after his Saturn return in Scorpio. This is the time when he started working on the first article, with a “newsletter” called Mountain Astrologer in mind. Initially just an 8 page newsletter. Initial goal was to promote Tem’s services in the Denver/Boulder area. Charged 59 cents, and sold it to a few local stores. Xeroxed about 100 copies at first. Decided to produce another issue 2 months later after a few dozen sold. Subsequent issues and rapid expansion. He advised Tem on how to expand. By the fourth and fifth issues TMA started to feature other writers. Took a road trip to promote the magazine at 1989 UAC in New Orleans. Moved to Grass Valley, California with Kate in 1994. Peak print circulation occurred in the early 2000s. Started offering digital version in late 2000s. TMA is unique in the community because it is very high quality. Has editors who help authors to improve their articles. Graphic design and layout. Some focus on aesthetic appeal. TMA became one of the main hubs for communication in the community. A number of questions submitted by listeners and patrons were asked and answered towards the end of the show. Thanks to Chet Zdrowski, Dawn Champine, S.J. Anderson, Sheila Roher, Demetrius ‏Bagley, Adam Madison, and others for the questions. Insightful behind-the-scenes information, and good promo-had no idea back orders are available for sale. Keep that up–I promise you in due time I will buy all of them, whatever you are able to scan and put up.